Magnus Cort Nielsen pictured crossing the finish line on Sunday. DENMARK’S MAGNUS CORT Nielsen sprinted to his first Tour de France stage victory and Geraint Thomas maintained his lead in Carcassonne on Saturday. 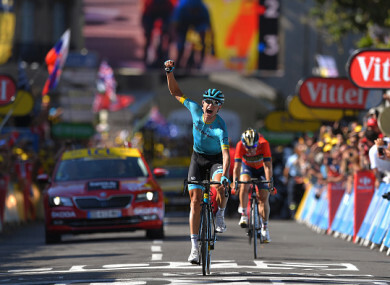 Cort Nielsen eased away from Ion Izagirre and Bauke Mollema at the end of stage 15 to give Astana a second victory in as many days following Omar Fraile’s success on Saturday. Majka led at the top of the Pic de Nore after passing Fabian Grellier and Julien Bernard, but the Pole’s hopes of securing a fourth Tour stage win ended when he was reeled in. Ireland’s Dan Martin moved away from the peloton to go on a solo mission at the foot of the Pic de Nore in an attempt to claw back some time after suffering a late puncture on Saturday. Peter Sagan’s dominance of the Points Classification has resumed in 2018 after he was banished from last year’s race following a crash with Mark Cavendish in Vittel. Victory in Sunday’s stage could have confirmed his success with a week to spare but he will have to wait a little bit longer after finishing the day with the peloton. Email “Debutant Cort Nielsen dominates three-man sprint as Dane claims first ever Tour stage win”. Feedback on “Debutant Cort Nielsen dominates three-man sprint as Dane claims first ever Tour stage win”.